Say It For You writers have created every type of content for every type of industry. Our clients range from small local businesses to large multinational corporations, and we have worked with companies in the medical device, drug, grocery, travel, automotive, legal, finance, and consumer products industries—to name just a few. Writing for websites is one of our specialties. We will visit your business, work hard to understand it completely, and revise current content or add new pages to your site. If you are starting a new business, we can also help you create the site content from scratch. Blogs and newsletters have a lot in common. We’ll help you put together good, consistent content on a quarterly, monthly, or more frequent basis. Need a perfectly written press release in a pinch? We’re on it! 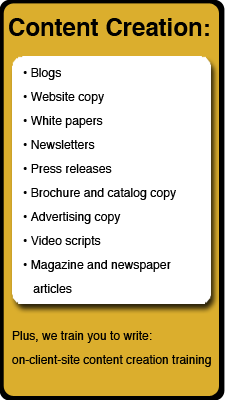 We write short and long copy for every type of print, radio, or TV ad. We write video scripts of any length. We can work from a brief or interview employees and customers to create original content. We write pieces in journalistic or advertorial style and on an extremely wide range of topics. Social media packages to keep you top of mind with online audiences. Click here to learn more. Infographics are a powerful way to communicate complex data in visual shorthand. Click here to learn more. Whatever your need may be, please ask! We’ll help you get the job done right!